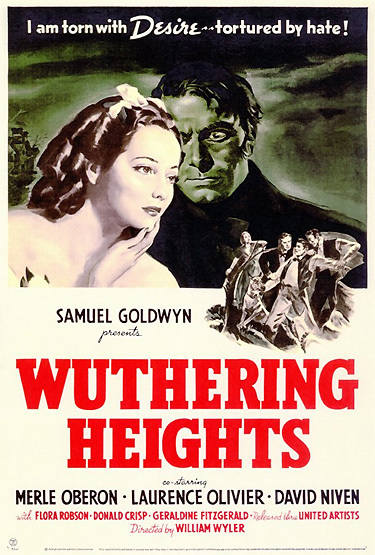 Wuthering Heights (1939) is director William Wyler's somber tale of doomed and tragic love, conflicting passions, and revenge. It is considered one of Hollywood's all-time most romantic/drama classics. Filmed with haunting beauty, it is the first film dramatization of Emily Bronte's wildly passionate 1847 best-selling literary masterpiece, from a screenplay written by Ben Hecht and Charles MacArthur (concentrating on the first two-thirds or 17 chapters of the 34 chapter book). Producer Samuel Goldwyn felt the black-and-white film was the favorite of all his productions. It is still considered the definitive version - and one of the greatest romantic films ever made. Bronte's novel tells about the eternal, smoldering love between two soul-mates: adopted gypsy boy Heathcliff and manor-born Cathy, who loves both the stable-boy and her worldly neighbor Edgar. The 1939 film was a critical success, earning eight Academy Award nominations in one of the most hotly-contested years ever - often called "the greatest year in motion picture history." The nominations included: Best Picture, Best Actor (Laurence Olivier with his first career nomination), Best Supporting Actress (Geraldine Fitzgerald with her sole career nomination), Best Director, Best Cinematography, Best Screenplay, Best Interior Decoration, and Best Original Score. It rightly deserved its sole Academy Award for Gregg Toland's expressionistic, moody B/W cinematography. [Note: This was Toland's only career Oscar, although his acclaimed, deep-focus film technique was also nominated in classics such as Les Miserables (1935), Dead End (1937), Intermezzo: A Love Story (1939), The Long Voyage Home (1940), and Citizen Kane (1941).] Also, the film's wonderful musical score by Alfred Newman is unforgettable. On the barren Yorkshire moors in England, a hundred years ago, stood a house as bleak and desolate as the wastes around it. Only a stranger lost in a storm would have dared to knock at the door of Wuthering Heights. During a raging blizzard, a bitterly cold, snowy night on the moors, a solitary traveler staggers for refuge toward Wuthering Heights. In the dark, mysterious house, Mr. Lockwood (Miles Mander), a "new tenant at the Grange," announces to his landlord Heathcliff (Laurence Olivier) (the master of the house) and his wife Isabella (Geraldine Fitzgerald) that he is lost and must stay the night for shelter. Although given a cold reception, Lockwood is begrudgingly given a room. He is led by candlelight to a drafty, depressing, upstairs "bridal chamber" guest room by Joseph (Leo G. Carroll), where he is told: "Nobody slept here for years." Lockwood cannot sleep, for the wind blows the shutter against the window all through the night. When he rises from his dusty bed to close the shutter, he hears a strange, ghostly, female voice, desperately crying: "Heathcliff." He shouts downstairs to Heathcliff: "Help, help, Mr. Heathcliff, Mr. Heathcliff, there's someone here." He draws his hand back in from the window, after appearing to have had someone clutch his hand in an icy grasp. Lockwood: Mr. Heathcliff, there's someone out there in the storm. It's a woman. I heard her calling. She said her name. It - Cathy, Cathy, that was it. Cathy? Oh, I must have been dreaming. Forgive me, Mr. Heathcliff. Heathcliff: Get out of this room. Get out! Get out I tell you! Cathy, Cathy, come in, Cathy come back to me...Oh my heart's darling. Cathy. My own, my, Cathy. Ellen: She calls him, and he follows her out to the moor. Ellen: A girl who died. Lockwood (startled): Oh no, I don't believe in ghosts. I don't believe in phantoms sobbing through the night. Lockwood: I don't believe that life comes back, once it's died, and calls again to the living. No, I don't. Ellen: Maybe if I told you a story, you'd change your mind about the dead coming back. Maybe you'd know, as I do, that there is a force that brings them back, if their hearts were wild enough in life. Seated in front of the fireplace with him, the housekeeper begins to tell the story, in flashback, of the tragic love between Heathcliff and Cathy forty years earlier. Wuthering Heights, "a lovely place in those days," was owned by a middle-class, early-19th-century Yorkshire widower named Mr. Earnshaw (Cecil Kellaway). Returning from a trip to the city of Liverpool, the congenial gentleman/farmer brought home a young, dirty-faced gypsy boy (Rex Downing as youth): "a gift of God, although it's as dark as if it came from the devil." The waifish boy was found unwanted, starving in the streets of the city, "kicked and bruised and almost dead...Nobody would lay claim to him." The gypsy boy is to be given a scrubbing and some "Christian clothes." Although the two high-class, manor-born children, Catherine (or 'Cathy') (Sarita Wooten as youth) and son Hindley (Douglas Scott as youth), are inhospitable, they are told by their father that he will be raised as one of them: "Children, you may as well learn here and now that you must share what you have with others who are not as fortunate as yourselves...We'll call him Heathcliff." The newly-adopted Heathcliff quickly becomes the companion/soulmate to Catherine as they grow up on the moors and ride horses together. During one of their carefree days, she challenges Heathcliff: "I'll race you to the barn. The one that loses has to be the other's slave." When Heathcliff wins the race, Hindley appears in the yard, showing his immediate antipathy and loathing for the intruder by resenting and tormenting him, and calling him a "gypsy beggar." Hindley's enmity for Heathcliff causes him to hit his step-brother in the head with a rock, knocking him unconscious. Wild-eyed, dark Heathcliff rages with primitive revenge: "How can I pay him back? I don't care how long I wait if I can only pay him back." Cathy: You're so handsome when you smile...Don't you know that you're handsome? Do you know what I've always told Ellen? That you're a prince in disguise...I said your father was the Emperor of China. Your mother an Indian queen. And it's true Heathcliff. You were kidnapped by wicked sailors and brought to England. But I'm glad they did. Because I've always wanted to know somebody of noble birth. Heathcliff: All the princes I ever read about had castles. Cathy: Of course, they captured them. You must capture one too. (Cathy points up at Peniston Crag) There's a beautiful castle that lies waiting for your lance, Sir Prince. Heathcliff: You mean Peniston Crag? Heathcliff: Aw, that's just a rock. Cathy: If you can't see that that's a castle, you'll never be a prince, Heathcliff. Here, take your lance and charge. (She hands him the riding whip) See that black knight waiting at the drawbridge - Challenge him! Now charge... (After a make-believe struggle) Heathcliff! You killed him. You killed him. You killed the black knight. Heathcliff: He deserved it, for all his wicked deeds. Cathy: Oh it's a wonderful castle. Heathcliff, let's never leave it. Heathcliff: Never in our lives. Let all the world confess, that there is not in all the world a more beautiful damsel than the Princess Catherine of Yorkshire. Cathy: (She curtsies down to serve him) But I - I'm still your slave. Heathcliff: No Cathy. I now make you my queen. Whatever happens out there, here, you will always be my queen. With the death of Mr. Earnshaw, Heathcliff's benefactor, Hindley establishes himself as the new master of the house and orders Heathcliff to become the stable boy: "You're not wanted up there...Go and help the stable boys harness the horse for the vicar. Do as you're told. I'm master here now." And as the children grew up, Hindley was indeed master of Wuthering Heights. It was no longer the happy home of that child. Heathcliff: The clouds are lowering...see how the light is changing? Cathy: It would be dreadful if Hindley ever found out. Heathcliff: Found out what? Can't you talk to me once in a while? Cathy: Shouldn't talk to you at all. Look at you. You get worse every day. Dirty, unkempt, and in rags. Why aren't you a man? Heathcliff, why don't you run away? Heathcliff: Run away? From you? Cathy: You could come back to me rich and take me away. Why aren't you my prince like we said long ago? Why can't you rescue me Heathcliff? Heathcliff: Cathy, come with me now. Cathy: And live in haystacks and steal our food from the marketplaces? No Heathcliff, that's not what I want. Heathcliff: You just want to send me off. That won't do. I've stayed here and been beaten like a dog, abused and cursed and driven mad, but I stayed just to be near you, even as a dog. And I'll stay 'til the end. I'll live and I'll die under this rock. That's what I want. Dancing and singing in a pretty world. And I'm going to have it. Come on, let's go and see. Come on. Isn't it wonderful?...Isn't she beautiful? That's the kind of dress I'll wear. And you'll have a red velvet coat and silver buckles on your shoes. Oh, Heathcliff! Will we? Will we ever? Cathy: Go on, Heathcliff. Run away. Bring me back the world. Heathcliff: ...I'm going. I'm going from here and from this cursed country both...But I'll be back in this house one day, Judge Linton, and I'll pay you out. I'll bring this house down in ruins about your heads. That's my curse on you. (He spits downward) On all of you. And so Cathy found herself in this new world she had so often longed to enter. And after some happy weeks, Mr. Edgar brought her back to Wuthering Heights. Cathy: Heathcliff. Is he here? Ellen: Oh yes, he came back one night last week with great talk of lying in a lake of fire without you. How he had to see you to live. He's unbearable. I wonder where he could be, the scoundrel. Heathcliff? Heathcliff? Heathcliff: Why did you stay so long in that house? Cathy: Didn't expect to find you here? Heathcliff: Why did you stay so long? Ellen: Heathcliff! What are you doing in this part of the house? Go and look after Mr. Linton's horses. Heathcliff: Let him look after his own. Edgar: I've already done so. Edgar: I simply cannot understand how your brother can allow that beast of a gypsy to have the run of the house. Cathy: Don't talk about him. Edgar: Cathy, how can you, a gentle-woman, tolerate him under your roof? A roadside beggar giving himself airs of equality. How can you? Cathy: What do you know about Heathcliff? Edgar: All I need or want to know. Cathy: He was my friend long before you. Cathy: Blackguard and all. He belongs under this roof and you speak well of him or get out. Edgar: Are you out of your senses? Cathy: Get out I said, or stop calling those I love names. Edgar: Cathy, what possesses you? Do you realize the things you're saying? Cathy: I see that I hate you. I hate the look of your milk-white face, I hate the touch of your soft, foolish hands. Edgar: Some of that gypsy's evil soul has gone into you I think. Edgar: So that beggar's dirt is on you? Cathy: Yes, yes! Now get out! In her room in front of her full-length mirror, Cathy forcefully strips off her dress and changes into her own clothes, and then runs across the moors to find Heathcliff at Peniston Crag.